Have you ever experienced that windows won’t allow you to delete a file, presumably because some service or dll is still using it ? Even when you know for a fact that it’s not in use ? Or maybe you have tried to delete a folder, but you couldn’t because a “File in the selected folder is still in use by Windows” ? Oh, I can hear you: “yes, but I use the “take ownership” function that I’ve added to my Context menu”. ALAS, Sometimes not even that will work – what then ? Do you have to Reboot your computer to be able to delete that file ? Earlier, Harry had an article about the Command Prompt (read it here) and his top ten commands. One of those were the command we are looking to use now: DELETE (DEL). The Command Prompt (cmd.exe) is what’s left of the old DOS (Disk Operating System) and some of us are old (shudders) enough to have actually used it as our main OS. Okay, enough of that. 1. 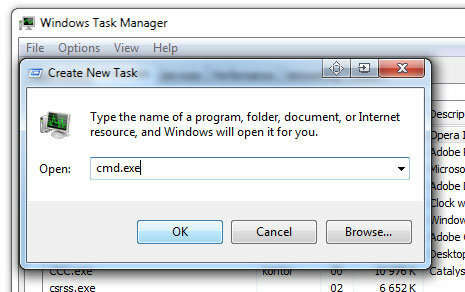 Right Click the Taskbar, choose Task Manager. 2. 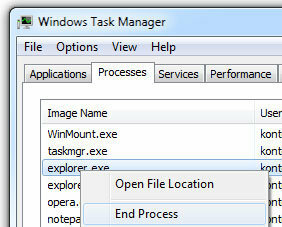 Open the Process Tab and locate Explorer in the list. All open programs will still be running (even task manager). You can still access the programs using ALT+TAB (or Windows + TAB). If you didn’t open the Command Prompt before shutting down Explorer, you may still access it by opening the Task Manager (which should still be running). Use ALT+TAB to flip through the running programs to open it. Should Task Manager by any chance be unavailable, you may open it by clicking CTRL+ALT+DEL, and choose Start Task Manager from the Menu. 2. Choose Run from the File menu. Thanks to Jothe3inv and Johnny for bringing us this extra tip. This is great info to know, but I now use the free program called Unlocker from emptyloop much easier.